A do-it-yourselfer can replace an electrical outlet on his own, so long as he takes the proper precautions. Read on to learn how to get the job done safely. Simply put, electrical work is dangerous. With projects of any complexity or sophistication, we wholeheartedly recommend hiring a licensed electrician. There are, however, simple repairs and updates that are appropriate for budget-minded do-it-yourselfers ready to proceed with careful attention to detail. By following these tips, you can replace an old or damaged outlet. It’s a simple job, and so long as you take the proper precautions, it’s safe. Adding a new outlet requires running a cable between the outlet location and the home’s electrical panel. That’s much easier said than done. For this job, we recommend that you hire a licensed master electrician, not least because building codes often stipulate that a permit is necessary for new electrical work, and in many parts of the country, only a pro can obtain the required permissions. In other areas, a homeowner can pull his own permits after passing a government-administered test. Old-fashioned two-prong outlets aren’t grounded, which makes them dangerous in the event of an electrical fault. 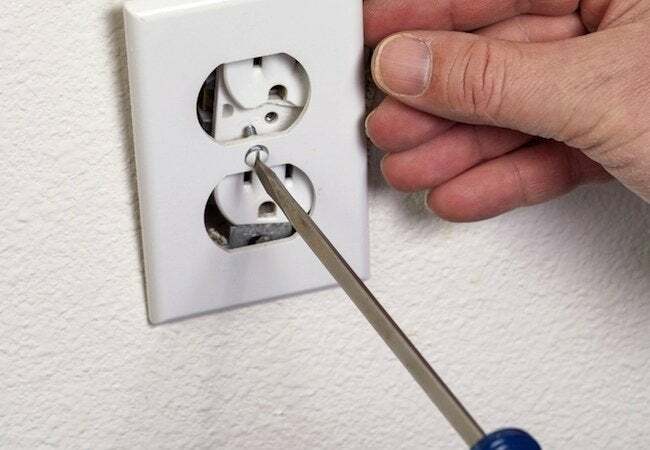 Without an electrician, it’s safe to convert a two-prong to a three-prong outlet only if the electrical box housing the outlet is metal and the cable feeding the box is armored. If these conditions are met, the box provides ground-fault protection (even though the outlet does not). How can you tell, without opening the wall, if the electrical box meets the criteria? Simple: Use a voltage tester. Insert one prong into the outlet’s shorter slot (the “hot slot”), then touch the other prong to the screw securing the faceplate. If the tester lights up, the electrical box is grounded; you can go ahead and convert the two-prong to a three-prong. If your electrical box isn’t grounded, you can still convert to a three-prong, but the replacement must be a ground-fault circuit interrupter, or GFCI (the type of outlet with a red button on its front). Before you go any further, it’s imperative that you cut power to the outlet you are replacing. Go to your home’s electrical panel and toggle off the switch associated with the circuit that sends electricity to the outlet in question. After you shut off the power to the outlet, use a voltage tester to double-check that it’s really off. Insert the tester’s probes into the top two slots on the outlet. If the tester lights up, you toggled the wrong switch on the electrical panel and you’ll have to try again. Continue your trial-and-error until you are certain the outlet is no longer receiving electricity. Don’t have a voltage tester? You can use a lamp instead, so long as you know the lamp works. Plug the lamp into the outlet, and if it doesn’t turn on, it’s safe to proceed. Unscrew the outlet’s faceplate. In most faceplates, there’s a single screw in the middle. Remove that screw, and the plate should come off easily. Next, unscrew the mounting screws that secure the outlet to the electrical box. Finally, gently pull the outlet away from the receptacle. You can now see three wires extending from the wall to the outlet. If the wires are attached to screws on the outlet, simply loosen those screws in order to free the wires. 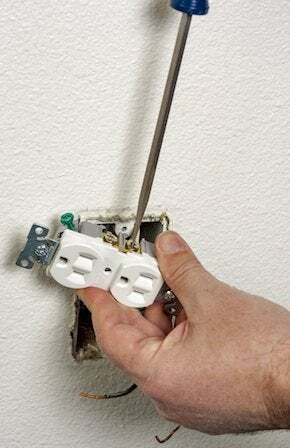 If the wires are snaked into holes in the back of the outlet, press the release slot and pull the wires, assuming they don’t come out on their own. Put aside the old outlet. You’re now ready to wire in the replacement. First, connect the neutral wire (white) to the silver screw on the side of the outlet. Make sure to orient the hooked end of the wire so that its curve goes clockwise, the same direction in which the screw turns as you tighten it. Connect the ground wire to the green screw, using the same technique as described above. Connect the live wire (black) to the gold screw, which is the last remaining on the outlet casing. Carefully maneuver the wires back into the electrical box, then screw the outlet to the box via the mounting screws at top and bottom. Finally, position the faceplate over the outlet and screw it back in. Go back to the electrical panel and restore power to the outlet you’ve now finished replacing.